By the time I had taken the boat back from Nya Älvsborg, it was 2 in the afternoon. Seeing as I was already in the harbor area, I decided to indulge my inordinate fondness for maritime museums by making a quick stop at Maritiman, Göteborg's floating ship museum. It also claims to be the world's largest floating ship museum, with as many as 20 ships available for viewing at a time, but I suppose we'll just have to take their word for that. 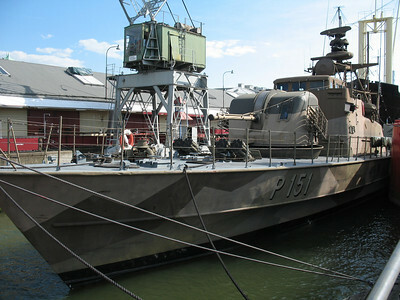 The twin highlights of the collection are two Swedish naval vessels: the destroyer Småland, and the submarine Nordkaparen. There happened to be an English language tour starting just as I got there, so I spent my first 45 minutes following the unfortunate Swedish tour guide, who was not only visibly wilting in the heat but also fighting off a cold. It was a good tour, nonetheless. My favorite moment came as he was explaining that the patrol boat they had on display was one of three which used to be responsible for both patrol and civilian rescue for the entire west coast of Sweden. They weren't enough to handle the job, but unfortunately all the rescue money goes to Stockholm, leaving the Göteborgare on their own. "So," he explained, "any boat captain in the west of Sweden who plans to have an accident soon learns to call the Danish coast guard, because the Swedes are not helpful." Oh, the ignominy. I spent a couple of hours wandering around the destroyer, which is almost entirely open to visitors. You can go all the way up the control tower, and then all the way back down to the lowest deck and crawl through the space between the boilers. 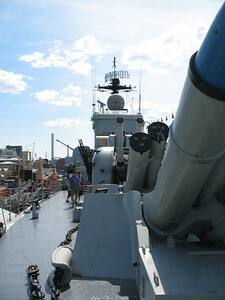 The below-deck areas were wonderfully cool compared to the rest of the ship, or even to the rest of Göteborg, which perhaps made me more inclined than usual to sit in one of the seven mess areas and watch a black-and-white film from the 50s which explained the care and feeding of your new Bofors 40mm anti-aircraft turret. As I wandered from one ill-lit, cramped room with no easy escape route to the next, I found myself thinking about each one in turn, "Well, that would just be a horrible place to die." 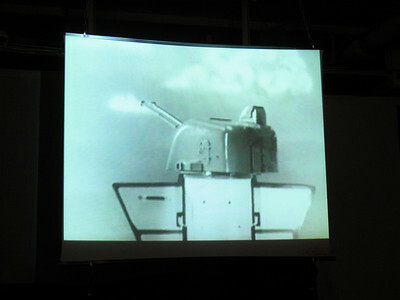 The submarine is a post-WWII affair, so it had all the charm (and head room) of a sardine can. 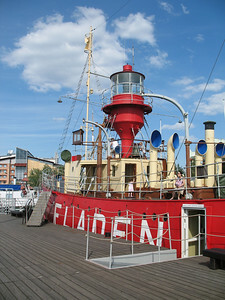 More interesting was the lightship Fladen, basically a floating lighthouse for those places where you need a signal but can't build one. The guide's description of life aboard the Fladen was less than appealing: awake all night to keep the lamp lit, anchored firmly in one place, so that when the seas were rough the natural rocking of the ship was continually broken by the anchor chains snapping taught at seemingly random intervals, sending everything on board rocketing about. Soup, anyone? So, by the time I'd poked around all of that, it was nearly 6, and I was hot, exhausted, and well sunned–definitely time to call it a day. As always, more pictures are available in the gallery . was that the first asterix sighting? and where was obelix? That was the only Asterix sighting. For the most part, Göteborg seems to be a Tintin town—I didn't get a picture, but there was a flower shop that also sold Tintin memorabilia, and there's even a bar called Tintin. I can only assume Obelix must be on the Smålands sister ship, the Halland. huh, i would have thought of asterix as more danish. but i guess if you're used to calling the danish coast guard, it's not such a big leap. i think someone is still trying to make a tintin movie, by the way.